If you’ve been in Edinburgh recently, chances are you might have heard about a rather exciting restaurant opening up in Stockbridge. It’s an absolute jewel box of a restaurant, located on Raeburn Place, and named after the Gaelic to journey or travel. This little hint should give you clue for what’s on the menu – wonderful, Scottish produce in dishes which are inspired by global cuisine. 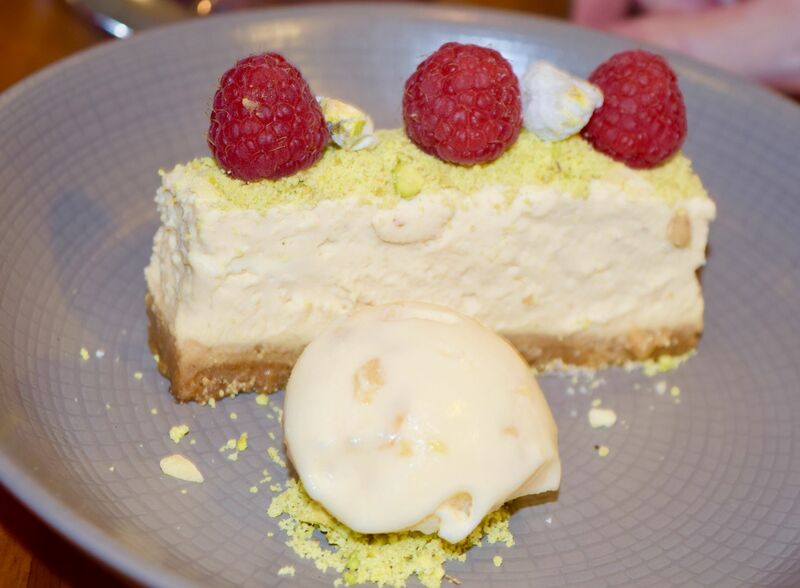 It’s a genius combination, and one which Head Chef Gordon Craig pulls off with aplomb! The restaurant only opened in January, but it’s already become something of an Edinburgh destination. It was fully booked on the Tuesday evening we went, and it was the perfect place to while away a rather drizzly evening. 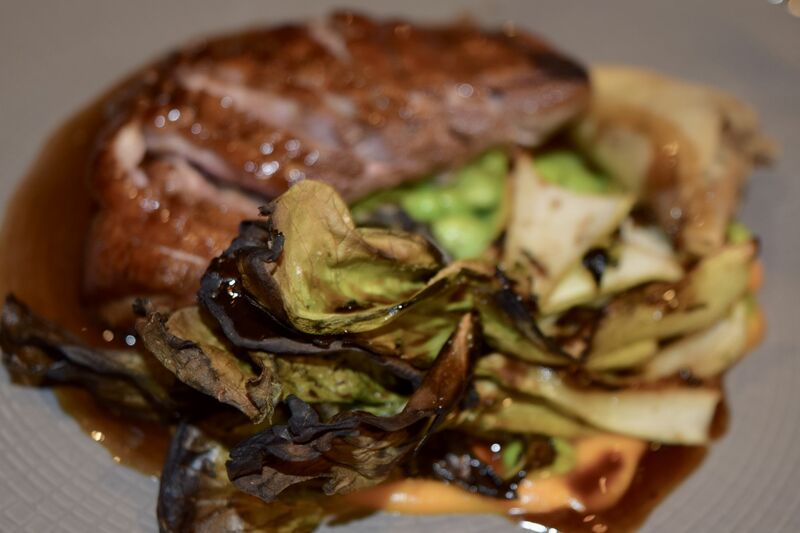 If you’re in early enough, there are two menus to choose from -a Market Menu which includes two courses for an incredible £10 per person, but we opted for the A La Carte offerings. In something of a food blogger fail, we ordered the same starters and main courses, but it was a tough choice. 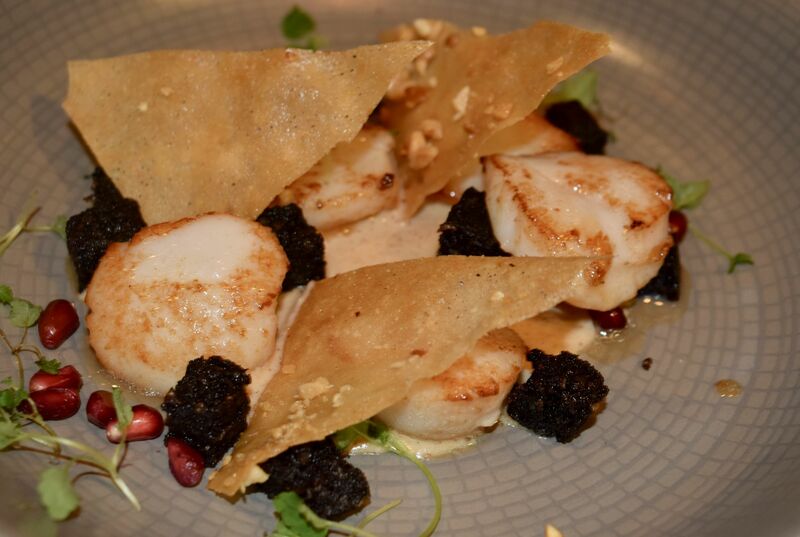 Everything on the menu sounds incredible, but neither or us could resist the lure of Pan Fried Scallops with Satay Sauce, Black Pudding and Pomegranate. (£9). 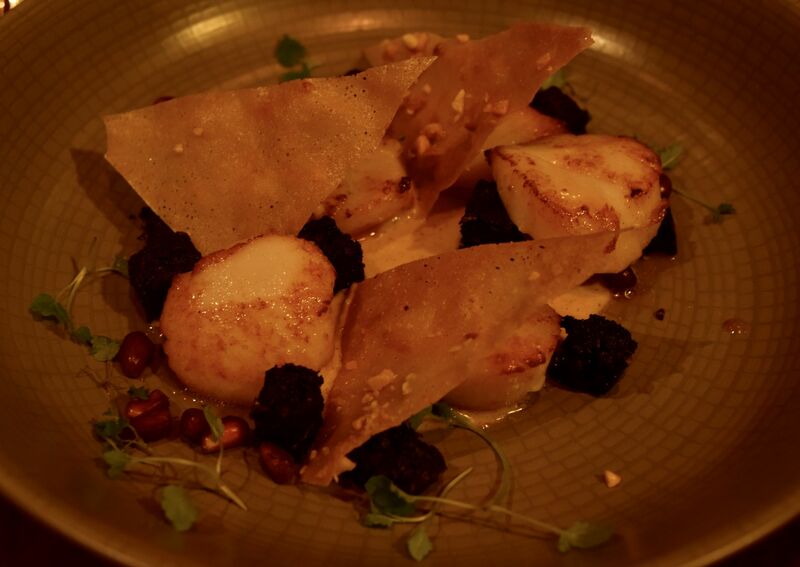 The portion was generous, with five perfectly cooked scallops placed amongst morsels of rich black pudding, pomegranate seeds and delicate peanut tuille. The combination of the buttery scallops, and black pudding, is of course, a classic, but the inclusion of pomegranate and peanut was genius. 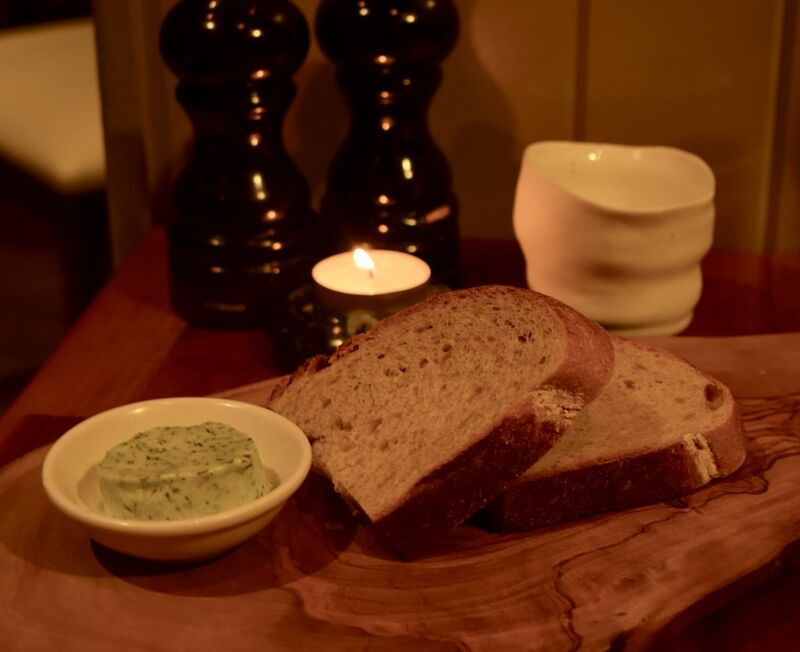 It was a starter which really exceeded all expectations, and was an absolute joy! 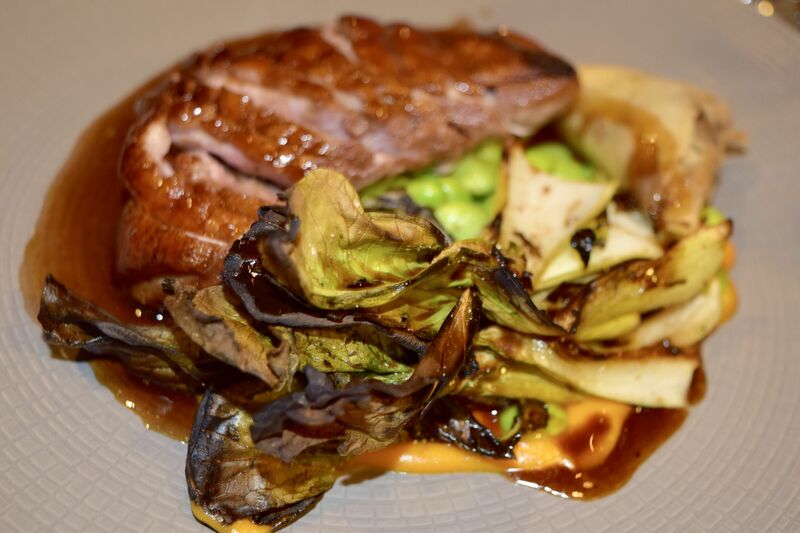 The mains were an equally tough choice, but the Maple and Five Spice Gressingham Duck Breast with Grilled Pak Choi, Edamame Beans and Shitake Samosa (£17) was absolutely dreamy. The combination of rich, moist duck with the charred greens, fresh edamame and mushroom samosa was just too good to resist! 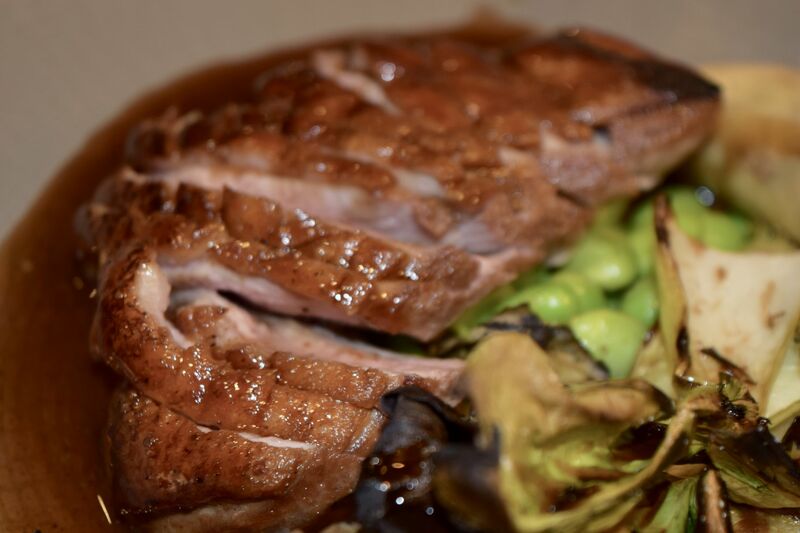 Honestly, I don’t order duck as often as I would like to, but this was absolute perfection – the meat was tender, juicy and flavourful, and the 5 Spice sauce it was served to was absolutely divine. Gently spiced, there was an almost coffee-like note which was just divine. The Shitake Samosa leant the dish a savoury note, and it was one of those meals which you just hoped wouldn’t end. The mi of flavours was just wonderful, and I’m not sure we chatted much, instead just motioning at out plates and declaring how good they were! Honestly, when we had popped in, we both thought we were going to skip pudding – it was only a Tuesday night after all! But after the absolute joy of starters and main courses, we both just kind of looked at each other, and agreed we couldn’t leave without finishing the meal off right! I opted for the Chocolate and Yuzu Fondant, with Orange Curd, Powder and Sorbet (£6.50), because honestly, Yuzu is one of my all time favourites, and I never see it on menus in Edinburgh. 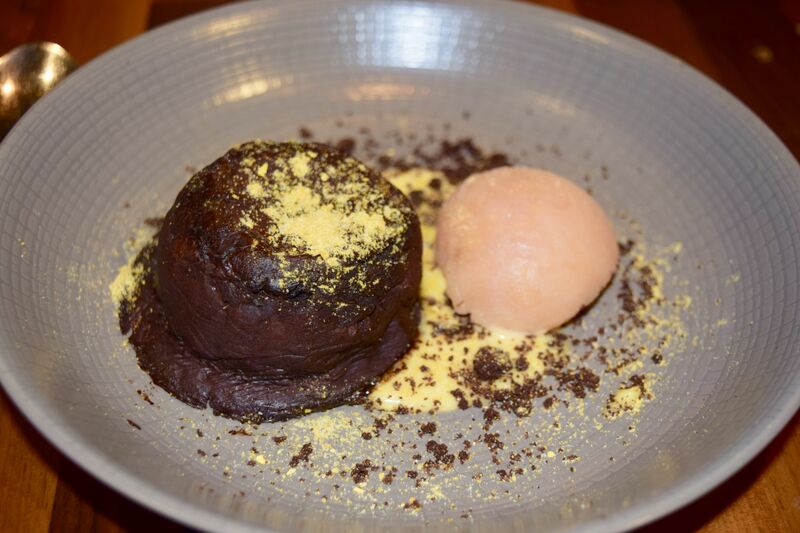 What came was the most perfect Fondant you could imagine – cut with a spoon, it puffed out a stream of molten chocolate sauce, which had been lightened with the hint of citrus. This coupled with the scoop of Orange Sorbet was just perfection. Warm, rich and gooey, it was absolutely heavenly. We also couldn’t resist a slice of the Lycheesecake with Stem Ginger Ice Cream (£6.50). This was, again, divine. The rich, whipped cheesecake was delicately flavoured with Lychee (again, a childhood favourite of mine) with a rich biscuity base. Studded with popping candy, it was an absolute joy of a dish – with the subtle perfume of the lychee contrasting with the ginger-studded ice cream. The desserts were an absolutely perfect way to end one of the best meals I’ve had in a long time, and I can’t wait to go back!